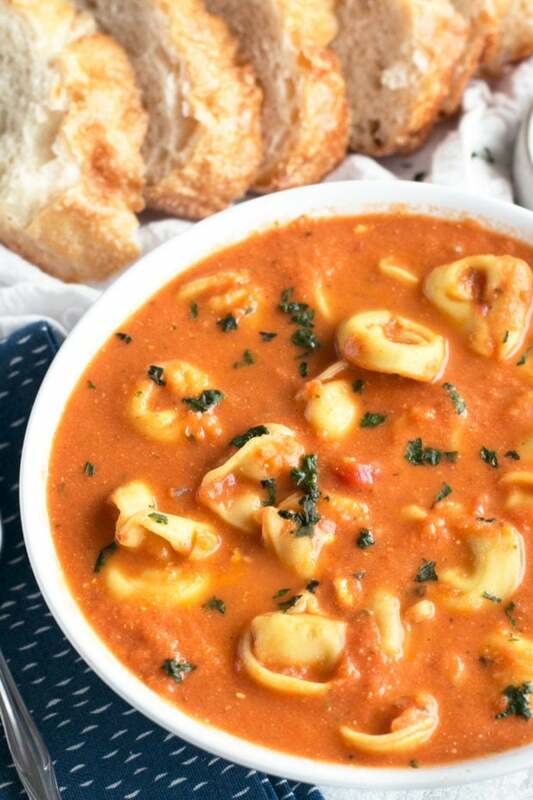 Curry Tomato Tortellini Soup is so easy to make and one of the best soups you’ll ever taste! 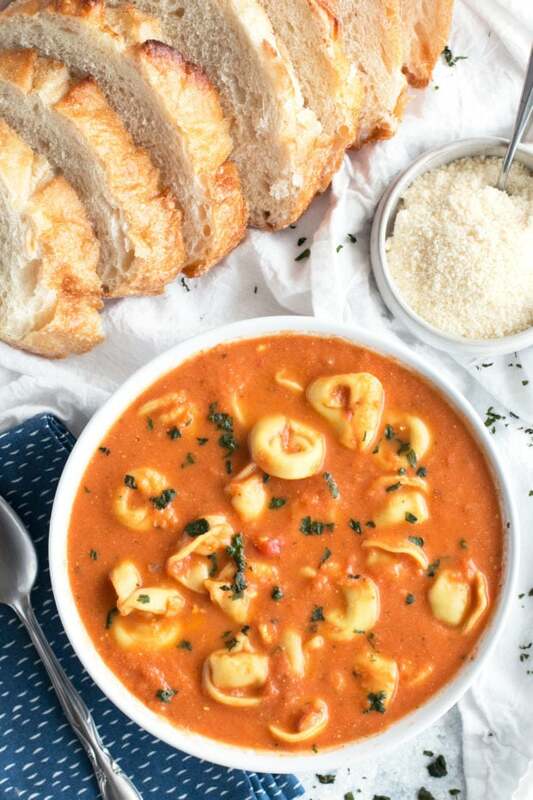 Creamy tomato soup is seasoned with fresh basil and curry spices to add extra richness to this hearty pasta soup. I swear, it’s the biggest curse and blessing to work from home. Working from home in my PJs = awesome. Not having anyone to cover for me when I’m out of town = not so awesome. My busy schedule is what brings me to this glorious soup though! Being a busy little bee makes me a tired lady at the end of the day, and all I wanna do is dive into a bowl of comfort that doesn’t take FOREVER to make. 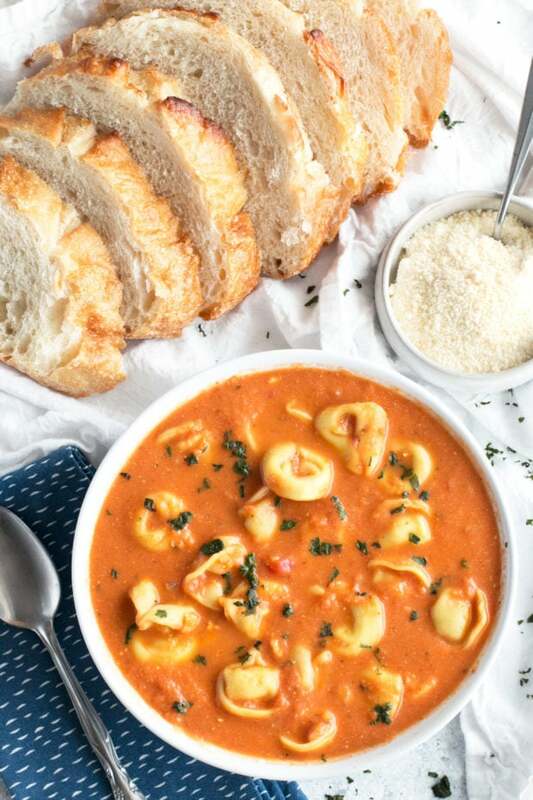 Instead of cracking a plain ol’ can of tomato soup or making a boring pot of spaghetti and sauce from a jar, take 30 minutes out of your day to get something complex and delicious on the stove! I LOVE the complex flavors of this soup. There’s a delightfully rich tone of curry throughout the soup which pairs wonderfully with the ginger, garlic, and fresh basil. 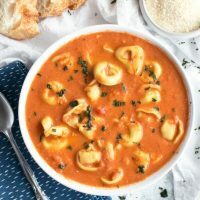 It also brings out the depth of the tomatoes and the cheese tortellini, making it almost like you are eating a grilled cheese and tomato soup all in one bite. Of course, you’ll have to pair it with some crusty bread to get that toasted grilled cheese texture (I know, so sad right? Darn, having more carbs… 😉 ), but I have a feeling that’s a sacrifice that you’ll be willing to make. 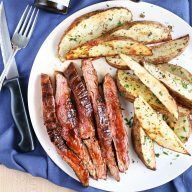 So head over to the store, grab your ingredients and in only 30 minutes you’ll be chowing down on this deliciousness. – I just have to say I freaking LOVE this cutting board. With changeable plastic cutting sheets that you can replace after time wears them down, it’s an awesome space saver and SO easy to clean! Pin this Curry Tomato Tortellini Soup recipe for later! 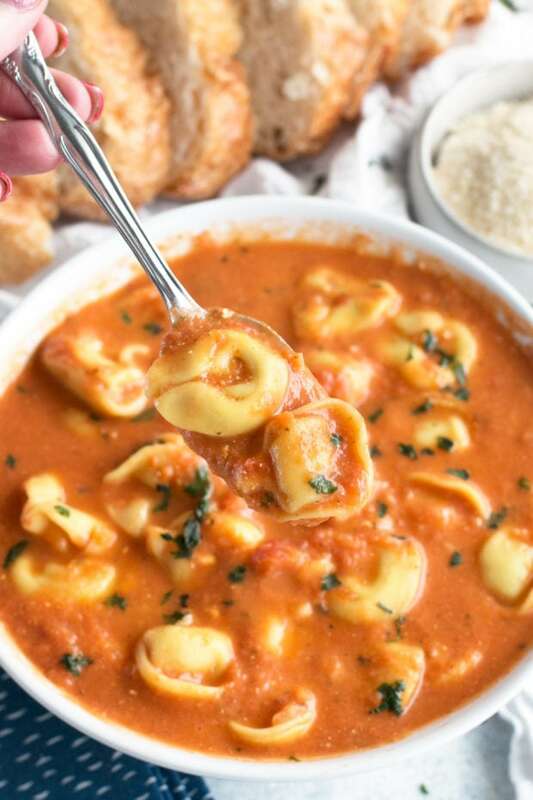 Comforting, warm and full of rich curry spices, this cheesy tortellini soup will warm you up from the inside out! In a large pot over medium heat, add oil. Once hot, add onion and garlic. 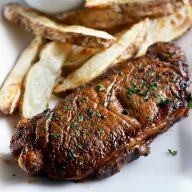 Cook until tender, approximately 5 minutes. Stir in ginger, crushed red pepper flakes, and curry powder. Fry for 30 seconds or so. Add diced tomatoes and vegetable broth. Stir in fresh basil, salt, and pepper. Bring to a simmer and let cook for 15 minutes. Use a hand immersion blender or a regular blender, blend the soup until smooth. Stir in Greek yogurt. 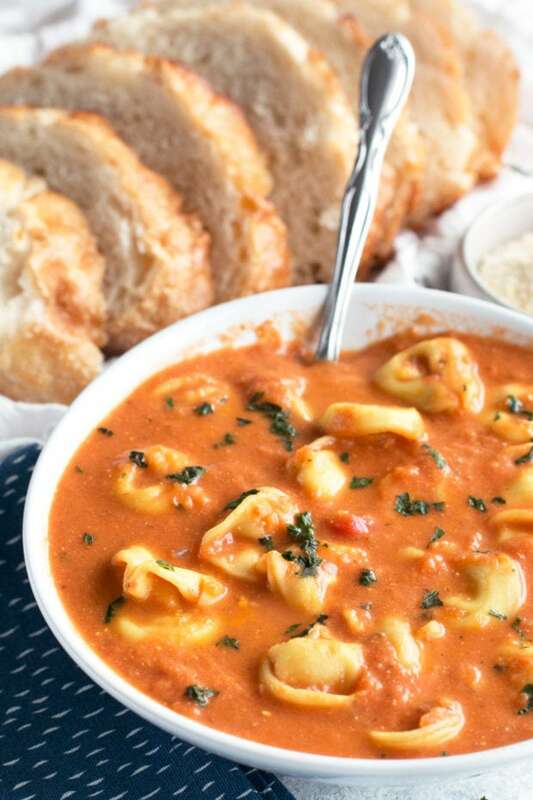 Add in cheese tortellini and cook on medium-low heat until the pasta is cooked through, approximately 7 to 8 minutes. 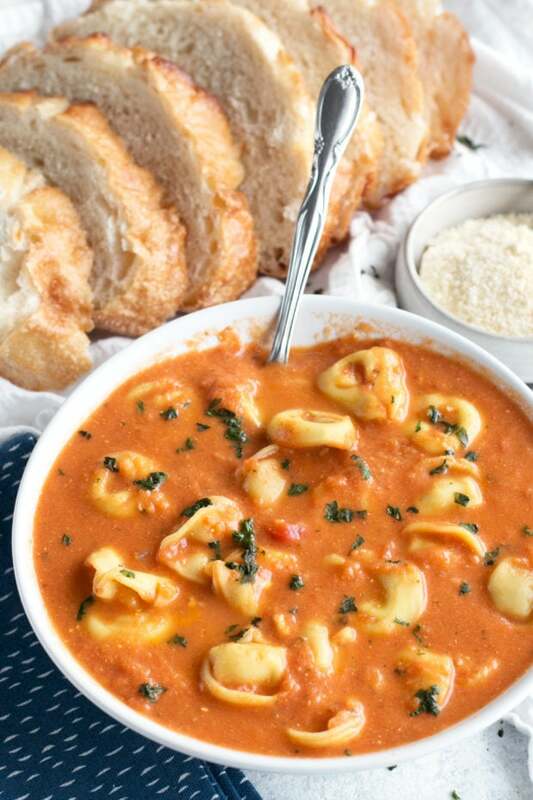 Serve warm with crusty bread on the side.